"Enjoy this spicy treat on crackers with cream cheese. It also makes a festive holiday appetizer." Sterilize 6 (8 ounce) canning jars and lids according to manufacturer's instructions. Heat water in a hot water canner. Place red bell peppers, green bell peppers, and jalapeno peppers in a large saucepan over high heat. Mix in vinegar and fruit pectin. Stirring constantly, bring mixture to a full rolling boil. Quickly stir in sugar. Return to full rolling boil, and boil exactly 1 minute, stirring constantly. Remove from heat, and skim off any foam. Quickly ladle jelly into sterile jars, filling to within 1/4 inch of the tops. Cover with flat lids, and screw on bands tightly. Place jars in rack, and slowly lower jars into canner. The water should cover the jars completely, and should be hot but not boiling. Bring water to a boil, and process for 5 minutes. 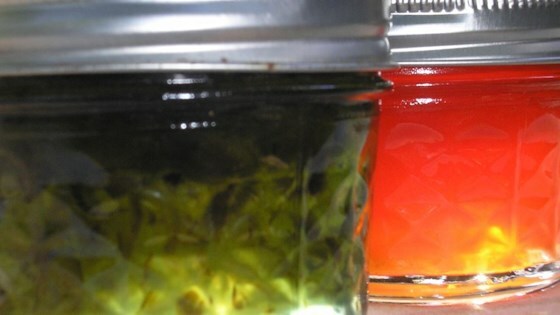 See how to make a spicy red and green bell pepper jelly.